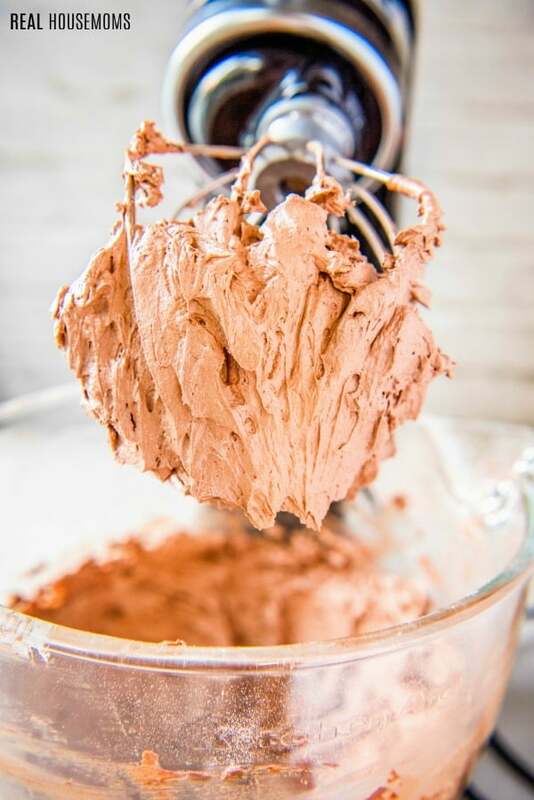 This simple, delightfully fluffy Chocolate Buttercream Frosting is the only recipe you’ll ever need for all of your cakes, cupcakes, and baked goods! 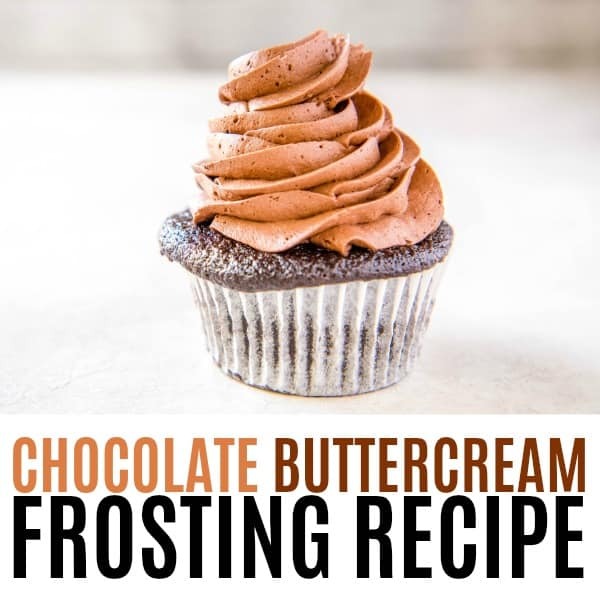 Next time you need to bake a cake or a batch of cupcakes, whip up this delicious Chocolate Buttercream Frosting! The convenience of store-bought frosting is alluring, but the taste is always sub-par when you compare it to a homemade buttercream. This chocolate buttercream frosting recipe is ready to go out of the bowl, perfect for piping on cupcakes, spreading on layer cakes and brownies, or filling for sandwich cookies. If you use this chocolate frosting recipe to fill a cookie sandwich then decorate with my favorite sugar cookie frosting for the most amazing cookies of your life! Do you have any idea how many frosting recipes there are in the world? Everything from whipped cream to cream cheese to the various European buttercreams, cooked frostings, ganache you can whip, meringues, etc…the possibilities, and flavor profiles are nearly endless! Having grown up in a house that always had an array of sweets in it at any given time, I developed quite the sweet tooth. As I’ve gotten older, I gravitate less towards baked goods, but I’d be lying if I said I didn’t still lick the spatula after making a homemade chocolate frosting – especially if it’s this easy Chocolate Buttercream frosting. First, place the butter and sifted powdered sugar in a large bowl. Be sure to use a whisk attachment to whip it on medium-high speed until it is pale and fluffy, about 5 minutes. Turn the mixer off to scrape the bowl at least once during this time. Next, add the sifted cocoa powder, vanilla, and salt to the mixture. Blend it all on low for 1 minute. While the mixer is on low, add the heavy cream in a slow drizzle. Once you’ve added the cream and the mixture is mostly combined, turn off the mixer and scrape down the sides and bottom of the bowl well. Finally, turn the mixer up to medium-high and whip the buttercream for 4-5 more minutes. You’ll end up with frosting that is impossibly shiny, light, and fluffy. Don’t worry about the air bubbles – that’s easily smoothed out when you use it. This recipe is an American buttercream, which is a combination of fat (butter in this case, but shortening can also is used) and powdered sugar. American buttercreams are known to typically be overly sweet and sometimes slightly grainy. Luckily, balancing out the sugar and smoothness is easy once you see the order and ratios – and I’ve cut out the guesswork here by telling you how I do it! The result is a ridiculously fluffy, chocolatey buttercream that spreads beautifully on any cake, but holds up like a champ when piped on a batch of fresh cupcakes. 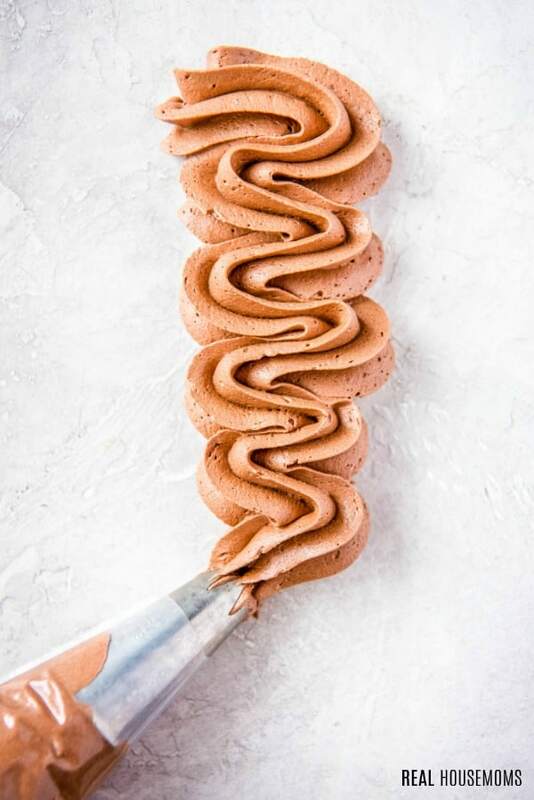 You’ll be getting requests for desserts from everyone you know after they try this frosting! Seriously it’s the best chocolate buttercream frosting, have I mentioned that already? What Tastes Best with Chocolate Frosting? Switch up your buttercream game with flavor! Add some hazelnut extract for a very Nutella-like twist. Love those chocolate oranges? A little orange extract and zest will transform this buttercream. Booze it up! Chocolate is delicious with rum, bourbon, and most other dark liquors and liqueurs. Mint chocolate fan? Mint extract and a handful of mini chocolate chips will calm that craving. Piping bags and tips: Disposable pipings bags handy to have on hand for filling desserts & donuts and food decorating. Pop a coupler and icing tip on your bag and you’re all set! Mixing Bowl: This mixing bowl is perfect for mixing and serving. I love how big it is! I can use it for anything and everything. 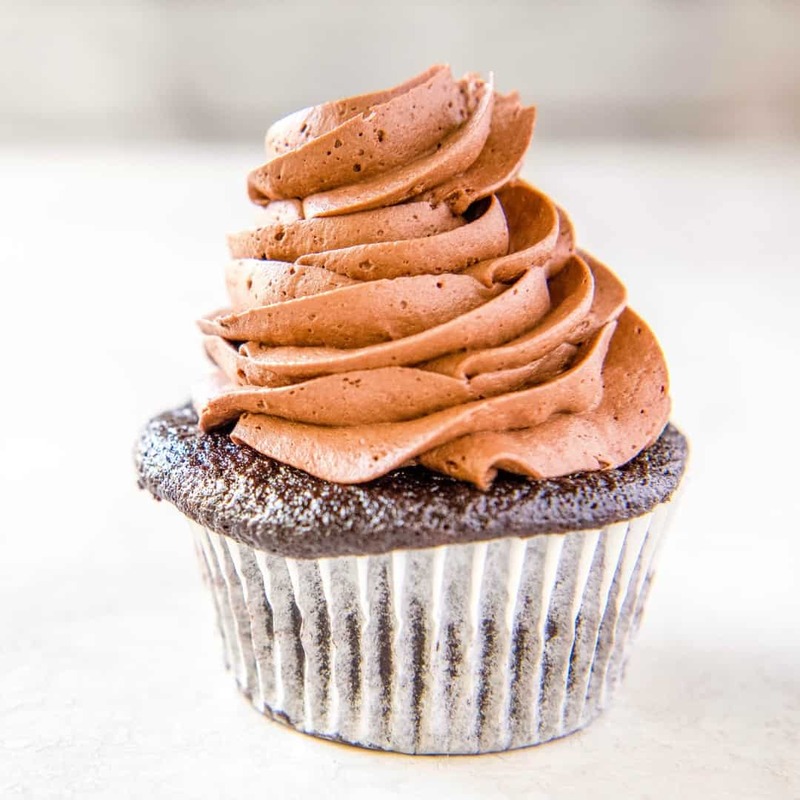 This simple, delightfully fluffy Chocolate Buttercream Frosting is the only recipe you'll ever need for all of your cakes, cupcakes, and baked goods! 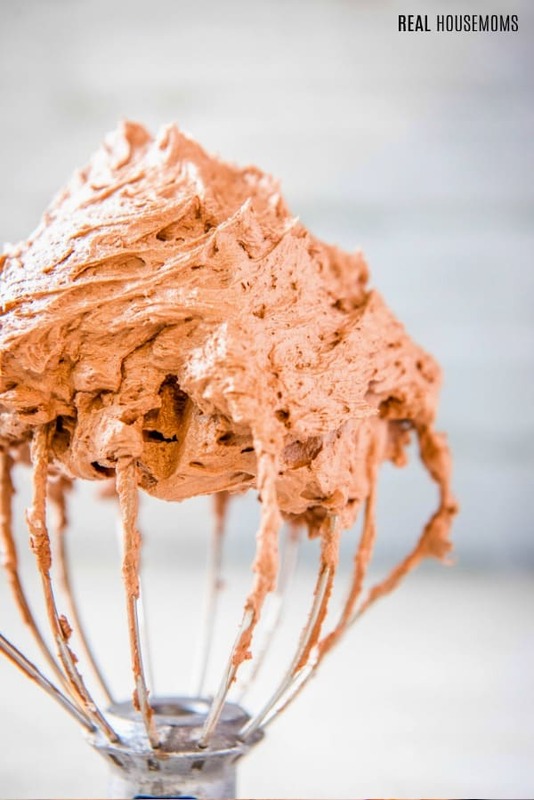 Place butter and powdered sugar in a large bowl (or in the bowl of an electric stand mixer) When using the whisk attachment, whip on medium-high speed until pale and fluffy; roughly 5 minutes. Scrape the bowl at least once during this time. Add the cocoa powder, vanilla, and salt, and blend on low for 1 minute. Add heavy cream in a slow drizzle as it mixes. Once the mixture is mostly combined, turn off the mixer and scrape down the sides and bottom of the bowl well. Whip buttercream on medium-high speed for 4-5 minutes, until it is impossibly shiny, light, and fluffy. This recipe yields approximately 2.5 cups of frosting, enough to pipe on 16-18 cupcakes or fill and ice a 6-inch cake. Double the recipe if you need enough to decorate anything larger than a 6-inch cake fully.